Hello!! how's your week?? Me very very busy!!! Alot of meet ups, alot of crafting, alot of baking!!! Yap!!! I started to bake recently after a long long break!!! Yesterday, I baked 2 loafs of strawberry breads. Hmm.... but the texture are more like cake!! ha ha... But its tasty!! 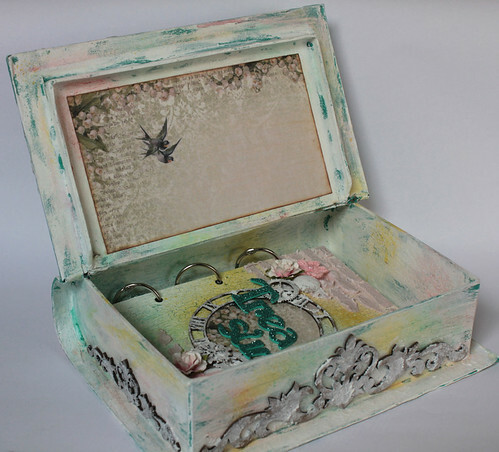 Today I want to share about a book box that I made awhile back in February!! I love this box!!! 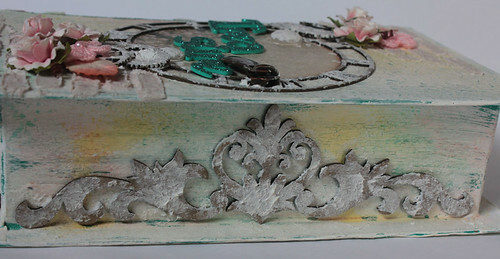 Hope I can get more of this box to alter!!! Anyone any idea where can I buy?? I got it from a friend. I painted it with a coat of turquoise acrylic paint, followed by a coat of crackle medium and a final coat of white acrylic paint. Then I misted it with glimmer mists. 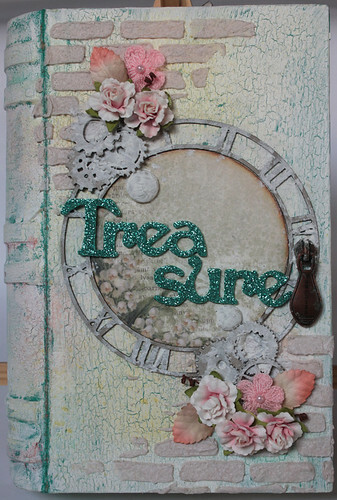 Added the mixture of glass bead gel and texture paste over a brick stencil at the top and bottom edge of cover. I love to use chipboards. Hence the clock and gears chipboards are added, painted over with texture paste. The zipper head from Prima acts as the handle to open the box. Here's the side of the box. Also added a chipboard shape. The inside of the box. The mini album inside is done with the same technique as the box. Each pages are made using chipboards and painted same way. I haven't add any photos inside so I will share again after I add. I hope you enjoy my project. More posts on other projects are coming up. Do keep a lookout too. Wow! You have been busy! This is amazing!